"On Wednesday, Aug. 1, 2007, at 6:05 p.m. (during evening rush hour), the I-35W bridge across the Mississippi River in Minneapolis collapsed, killing 13 people and injuring 145. At the time of the collapse, repair work was in progress on the deck of the bridge, resulting in an additional 287 tons of construction material and equipment being on the bridge deck." The National Transportation Safety Board has reviewed extensive evidence from the site of the collapse if the I-35W bridge and has determined that the bridge initially failed at the U10 truss joint, which is shown in Figure 1. The evidence supporting this conclusion consists of the recovered sheered U10 gusset plates and the camera footage of the collapse with the initial failure occurring near the U10 joint. The NTSB has contracted with GeddesPhysics Laboratories to determine if the failure of the U10 joint could have been caused by the additional weight of the construction material and equipment. By performing a Newton's Second Law analysis on the truss joints under normal operating conditions (weight evenly distributed along the bridge deck), your team of engineers will determine if the normal operating load on the trusses provides any insight into the cause of the collapse. Was the collapse due to an inherit design flaw in the bridge or due to the additional weight? 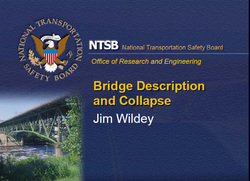 See the attached data contained in the "Bridge Description and Collapse" document from the NTSB to begin your analysis. Special thanks to B. J. Feldman, Univeristy of Missouri-St. Louis for his support and generous contributuions to this project.